I need help picking out the characters I'm going to put on the boys shirts. I want to make 6 each for when we go to Disney. I have already had a shirt each made for them. With Mickey and their names. I was going to paint using fabric paint. I have the paint already. And Michaels has a sale on for shirts. I was going to do each day the same colour shirts and same Character. I don't want all 6 of them to be Mickey. I was thinking Phineas and ferb, Mr potatoe head, donald duck. What other Characters do u think? Goofy, Donald Duck, Buzz & Woody, Lightening McQueen, Jake & the Neverland Pirates, Handy Many.... if you have the Disney Jr channel scan through it for ideas. Pirate shirts are a good idea. They have the Pirates League at WDW now which seems to be very popular. Ohh so easy and so much fun! Last edited by SydandPaige'sMom; 04-14-2012 at 08:19 PM. You need to start getting paid (by Disney) for your advice!!!! I was just going to say now that Lori replied no one else needs too lol!! She's always got the best advice!! I want to see the shirts when you are done! And I cannot believe I totally left out Nemo from Epcot! Something with Nemo or Crush would be cute! Aye and yes...Jake and the neverland pirates as well for DHS. Last edited by SydandPaige'sMom; 04-14-2012 at 09:15 PM. Last edited by 3littlepiggies; 04-15-2012 at 08:18 AM. Last edited by 3littlepiggies; 04-15-2012 at 08:38 AM. we bought shirts down there at walmart but we bought shirts that had one character on it each shirt (mickey,goofy,donald) and it was so much fun watching the characters interact with ds when he had their shirt on. It was too cute, so he wore a differerent one everyday. And he also wore buzz and phineas and ferb. What was Noah fav shirt? you are definately not going to get anything for $3 there so making them is a good deal. I think the shirts we bought him were around $7. 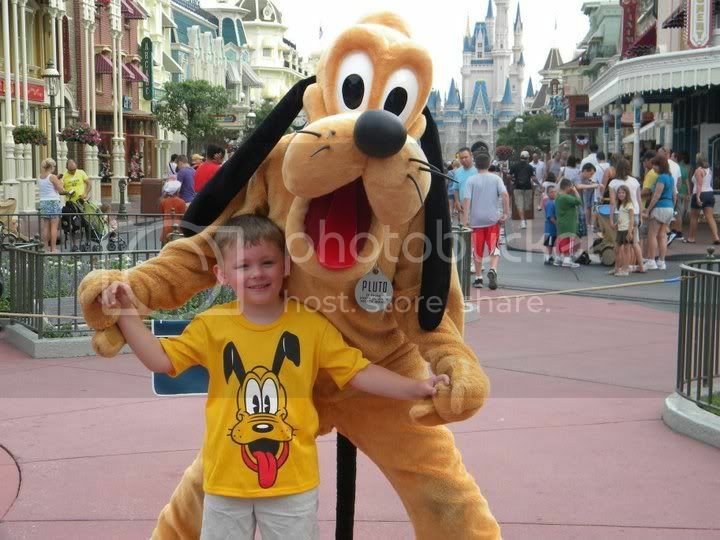 He wore donald goofy mickey and pluto. Pluto spent well over 5 minutes playing around with ds because of his shirt. WE have so many pictures of that, he loved it. By 3littlepiggies in forum Disney vacations! By laurana'smom in forum Disney vacations! Our Disney Trip!! Where to start?! By LoveMyGirls22 in forum Disney vacations! By one ordinary girl in forum Disney vacations!